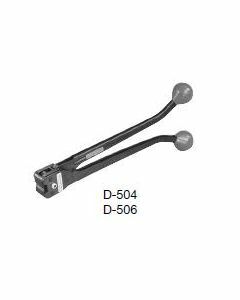 Model D-504, D-506 and D-58 front-action sealers have handles that are perpendicular to the strapping. The side-action D-34 sealer is positioned at right angles to the strapping. To operate, spread the handles, grip the seal between the sealer’s jaws and push the handles together.